Mermaids have been a part of myths and legends for years and years. Many cultures have their own stories of mermaids or mermaid-like creatures that dwell in the lakes, rivers, seas and oceans. Some are depicted as being fierce predators that use their beauty to lure sailors and unsuspecting humans to their death. Some are more monstrous in appearance than they are human with tendencies that are equally as beastly. And then, there are the merfolk that are typically shown in the cartoons and fairytales that children are most familiar with... kind, magical and stunningly gorgeous half-human, half-fish beings that are the friends of fairies, unicorns, fauns and other mythical creatures. 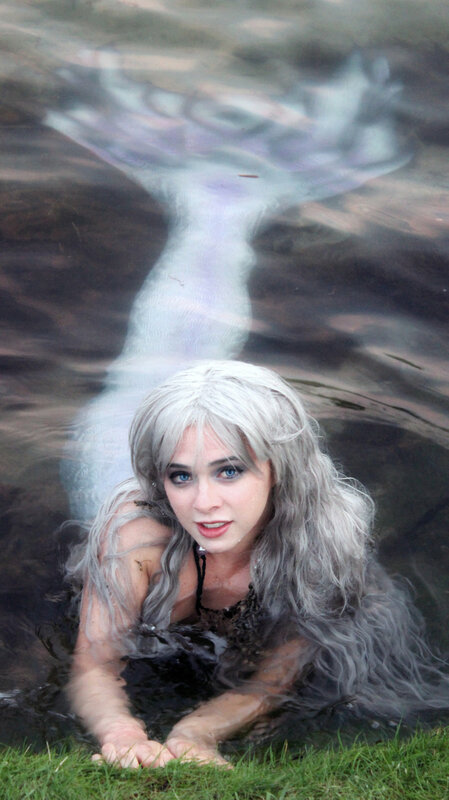 The following videos and pictures are that of the most commonly seen type of mermaid... the "Classic Mermaid Princess." Here, you will learn about a mermaid named Phantom. The name "Phantom" does not sound like a very friendly name. It is the type of name you'd expect a vampire or an evil witch to have, not a good-natured mermaid. It is because of her pale appearance, and the disbelief of the sailors who see her, that she has adopted her name. Fishermen and other adventurers of Lake Michigan have often spotted the eerie ghost-like mermaid drifting past their boats on misty mornings or well past dusk. Many think they are delirious when they spot the creature. After all, mermaids are not real. They must have seen a large fish or a ghost, even... but certainly not a mermaid! And so, she became known as a ghost, or a "Phantom." Do not let her strange name fool you though. While she does sometimes look an evil spirit, there is not a bad bone in her body. Most tales of mermaids take place in the seas or the oceans of far-away countries. Many myths and folktales will tell of the habits and temperaments of their fairy tale subjects. There are very few stories about freshwater mermaids, however, and very little is known about them. With Phantom being one of the few mermaids to have been seen in the Great Lakes area, there is still much to be discovered about the lives of the fairytale beings that dwell below the surface of the waters surrounding Michigan. While not much is known about freshwater mermaids, there are some well-known practices for increasing your chances of seeing one. If you are out enjoying the beaches of Northern Michigan be on the lookout for mermaids this summer. Phantom tends to be sighted most often in Grand Traverse Bay, Lake Leelanau and at Good Harbor Beach, although other merfolk have been rumored to have been sighted near Grand Rapids as well. It is important to note that mermaids do NOT seem to enjoy swimming in highly polluted waters or coming to shore on garbage laden beaches. For the best chance of seeing one, make sure to stick around Grand Traverse County and Leelanau County (or check your local area for nearby sightings) and be certain to keep the lake shores clean. Bottle caps, plastic waste, broken glass and toxic runoffs (fertilizer, pesticides, sewage, ect.) are a hazard to all lake life, including mermaids. If you wish to spot a mermaid, select your location carefully and make sure to be respectful of their habitat. Below is a video showing that gives more information on Mermaid Phantom and how to maximize your chances of coming into contact with her. If you happen to find Mermaid Phantom, DON'T WORRY! She is relatively blind, but once she detects you, she will be curious and possibly even eager to chat. She is great with humans of all ages and will get along fine with your children/ young adults. Be certain to tag her on Instagram @the_magic_crafter!